The Island of Dr. Moreau: A Possibility, by H. G. Wells – Book Review by Fred Patten. 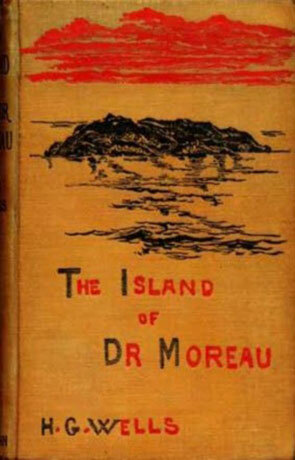 The Island of Dr. Moreau: A Possibility, by H. G. Wells. Frontispiece by C.R.A. [Charles Robert Ashbee]. London, William Heinemann, April 1896, x + 219 [+ 1 + 34] pages, 6/-. The public focused less upon the animal-men than upon Dr. Moreau’s callous vivisection experiments. In the novel, the physiologist comes across as an obsessed sociopath who cares only for his scientific research, and is oblivious to the pain he causes to his animal subjects. But to the public, he was a crazed monster. This image is clearly emphasized in the second motion picture adaptation, Island of Lost Souls (1932), in which Charles Laughton plays Dr. Moreau as a whip-cracking sadist who seems interested in his experiments only as a justification for his cruel tortures of his victims, and to create subjects whom he can rule as a god.